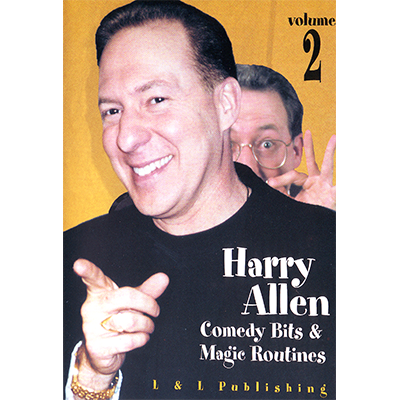 Comedy Bits and Magic Routines features Harry in his natural environment, in front of a fun-loving audience, demonstrating his favorite magic effects and showing off his encyclopedic supply of one-liners. Along the way, you'll gain insights and learn finesses on tricks you may have resigned to your magic drawer long ago . . . if you can stop laughing long enough. Dream Bag - A flat paper bag magically produces three jumbo crystal flower boxes and three 18" silks. Foursome - Four fanned cards change to totally different cards, front and back. Flying Cards - How about two thought-of cards vanishing from the table and appearing in the spectator's pocket. Unbelievable! Future Mental - Mentalism at its best. A thought-of colored ball vanishes and appears in the magician's pocket. Repeated with no reset. Alligator Coins - Two half-dollars change into two English pennies. Triception - ESP magic where the spectator calls the shots and all predictions come out correctly. Calculator Prediction - You can predict names in phone books, Bibles, or textbooks with a calculator that you have no control over. Golden Key - Move the parts of a key in all directions, then hand it out as it turns into a normal key. Psychic Escape - A visual penetration of a thought-of colored lifesaver disc from a cord. Card in Glass - A selected card is shuffled and left in a glass by the spectator. Silk to Flame - From bare hands, you produce a silk, then turn it into fire, only to have it all vanish. X-act Match - A thought-of card is the only card in the deck with an "x" on the back. No force, no roughing fluid, no set-up. Shrinking Die - A normal-sized die diminishes to a tiny die.